Mixels round two! This time we take on the ultimate challenge of building yet another fire type Mixel, Vulk. The back of the packaging is exactly the same as with Flain, except for Vulk being selected. 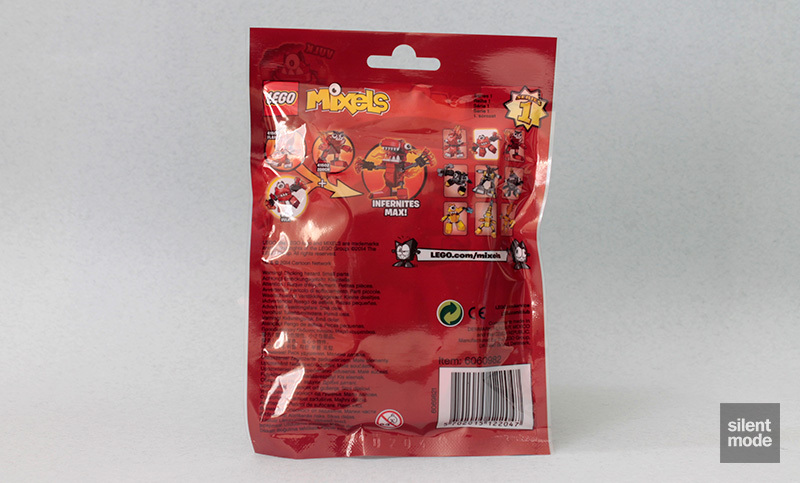 Like with the previous sets, the parts all come neatly packaged in a plastic bag, with crisp instructions on the side. Immediately noticeable in this set are the number of unusual and interesting parts, namely how many more there seem to be in this set than with Flain. This time around we have a three tooth plate in White, which makes an appearance in four other Mixels sets and 70123 Lion Legend Beast from the Legends of Chima theme. I like this one as opposed to the odd-sided on that comes with Flain, and you can see a number of cool techniques you can add to your MOCs over at The New Elementary. Only three of the Mixels lay claim to the 2×2 round tile with an eye print, but it can be also found in a couple of 2014 Creator sets (31019 Forest Animals and 31021 Furry Creatures). Again, some people may be going crazy over this particular part, but in this case I can understand the fascination. In a similar building process to Flain, we start with the body and make quick use of the new joints parts. 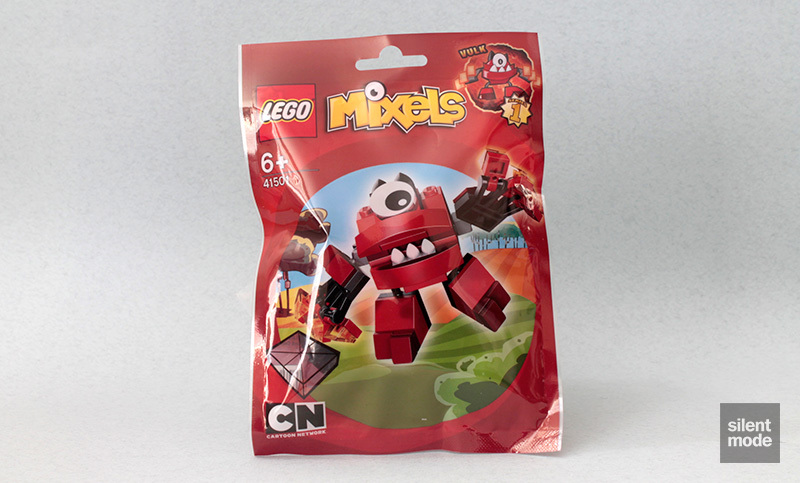 This time the Black plates with the ball joints – currently exclusive to Mixels, and can be found in two other sets – are used to make the legs. Those arguably annoying – but oh-so-useful – whatever-they’re-called Black plates are once again used to form hands, where Vulk is given just three fingers on each side. The White toothed plate is also added to the body to give it some teeth. Melt mountains with the sizzling hands of Vulk! One-eyed Vulk is the strong but dim-witted member of the Infernite tribe. The scorching-hot hands of Vulk can melt escape routes through solid rock and fend off Nixels. Some of the remaining parts in this set go towards building this little thing, which is called a Nixel. 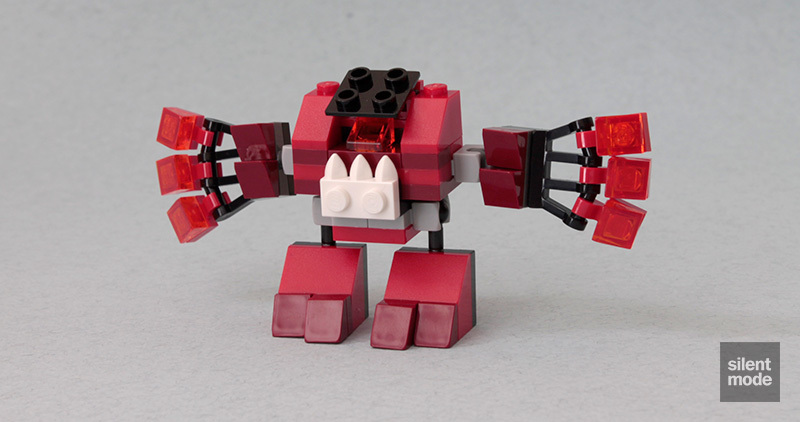 Nixels, believe it or not, are the antagonists to the Mixels, and they go around tearing things apart. This Nixel only appears with Vulk in the red category, and you can also find its printed 2×2 round tile in the yellow category. For whatever reason, Vulk comes with far more spares than Flain – most of them appear to be for Vulk itself. I like that fact that Vulk has the new ball joints for both the arms and legs, which makes it much more poseable than Flain. The fact it comes with a number of joint parts, and other potentially useful parts, is also a bonus for scavengers. I prefer the Flain build over this one, however, as Flain makes for a more interesting character. I’m giving this one 6.4/10, mainly due to the inclusion of numerous joint parts.